If you live in the Bay Area and are interested in joining some of these epic (but very casual) hikes, contact me. Land's End (San Francisco, 5kms, easy): The trail starts behind the Legion of Honor and coasts the ocean towards Sutro Baths. See the following one for the trailhead of Mission Peak in Stanford Ave. This hike is about 16kms by the Bay Area Ridge trail via Monument Peak and Mt Allison. From Levin Park one can take either Agua Caliente trail or Monument Peak trail. Eventually they join on a hill marked by a very high tv tower. It takes about two hours to reach this tower. Follow the sign for Bay Area Ridge Trail (you may have to jump a gate that seems to be always locked). The trail goes to the right of Mt Allison and (after another gate) leads up Mission Peak. It takes about 3 hours to the top of Mission Peak. The rest of the way is steep downhill towards the Stanford Ave parking lot in Fremont. Ed Levin park trailhead: take 237 east and continue on Calaveras Rd when 237 ends (past 680). Turn left on Downing Rd into the park. Drive as far as you can into the park. That is the Tularcitos trailhead. (A regional trail also leads from Mission Peak 3 km south to Monument Peak, then on into Ed Levin County Park in Santa Clara county). The main parking lot to San Bruno Mountain State Park is located at 555 Guadalupe Canyon Pkwy in Daly City. There are two main loops that afford great views of the Bay all the way to San Francisco (when the mountain is not covered in fog): the very short Saddle Loop and the 5kms Summit Loop. The summit itself is pretty ugly, but one side gives you postcard-quality views of San Francisco while the other side gives you views of Pacifica. On a clear day you can see Mt Tamalpais to the north, Mt Diablo to the east and Montara Mountain to the south. The name "mountain" is wildly exaggerated. It's a little hill. In late spring and early summer, wildflowers are the main attraction. It's the other side of the Golden Gate Bridge. Map. Park one car in Muir Beach: take exit 1 off 101 and drive west to Muir Beach. Start hiking in Rodeo Beach: take the first exit north of the Golden Gate Bridge (it has different names, depending whether you are coming from north or south) and go west up the hill, pass Hawk Hill, go down the very narrow road, follow signs for beach. From Rodeo Beach to Muir Beach the distance is about 11 kms. The detour to Tennessee Beach is about 2 kms each way and definitely worth it (there are shortcuts, but not recommended). The total distance is therefore 15 kms. The views are stunning. Unfortunately, the trail is quite crowded and horses are allowed. Shortcuts are recommended if you want to avoid crowds and horses (particularly the Pirate Cove trail, north of Tennessee Cove). Most people hike El Sereno from Montevina Road, but a slightly tougher hike can be done starting from Sheldon Road. Unfortunately there is no parking at the Sheldon trailhead. Just follow the dirt road straight ignoring all the turns and you'll reach the trailhead on the other side coasting a ridge that offers views on Silicon Valley, Lexington Reservoir, etc. 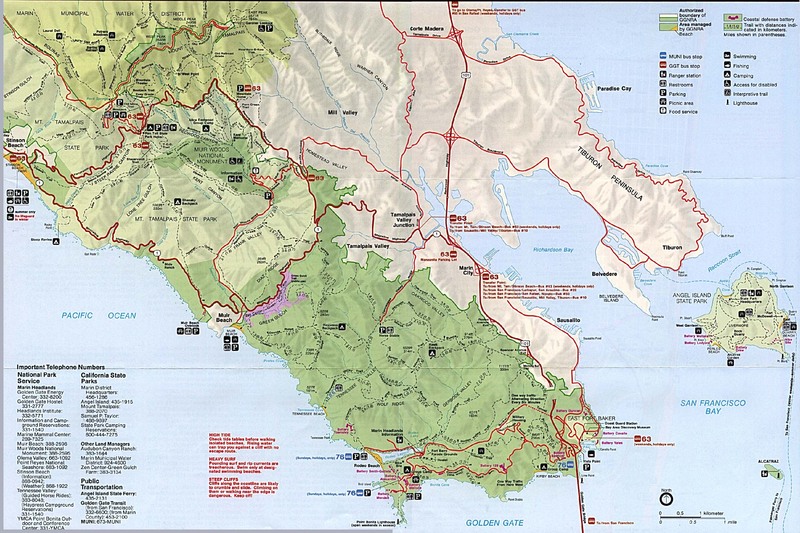 Directions for the trailheads: Take 92 west towards Half Moon Bay, turn south into 35, drive about 6kms. The trailhead parking lot for the North Ridge trail is confusingly located next to a restaurant on your right hand side. This trail soon connects with the Whittemore trail that dead ends at Higgins Purisima in Half Moon Bay. Directions for Skyline Ridge Trail: Take 84 west, turn south onto 35, drive about 6kms to the intersection with Page Mill Rd. Turn right and park. You can leave another car at the parking lot on the left-hand side just before the unpaved Charcoal Rd (2kms before the junction with highway 9). Start from the Trudeau Center on Skyline Blvd & Crestmont Dr. Public transportation: http://www.transitandtrails.org/trailheads/261/ From there take the Golden Spike Trail Of Redwood Park to the Mac Donald Trail and Brandon Trail of Anthony Chabot Park, loop around the lake, picnic by the lake, and go back.